Big E has taken to wearing a spiderman suit as often as he can. It is one he got for Halloween two years ago and he is outgrowing it, but it has puffed up muscles and it makes him feel invincible. With this suit, he has the courage to climb trees, jump down small stair cases, climb beds, and various other things that weren’t meant to be climbed. When someone points out his muscles, he beams with pride as he sticks out his chest and curls up his arms. The world is large for Big E, and his heart is very gentle. If this spiderman suit makes him feel brave, I’m all for it. But I better get a bigger one before he outgrows it! This weekend was the first time that we attempted to complete an entire AHG badge in one weekend. It was a lot of work for C, but she seemed enthusiastic about most of it and it was a great chance to spend some extra time with her. One of the things she did for her “My Style” badge was to make some paper dolls and create a clothing line for them. She chose to feature some evening wear, so she spent several hours today working on her doll clothes. She was very pleased with the end result and I was happy to see her working so diligently on it. Tim has had a sneaking suspicion about Big E for awhile now that I have kept trying to explain away. He kept insisting that perhaps Big E is red/green color blind. For the most part I thought perhaps he was just mixing up his words, but last night he picked up a little jar of red paint and started asking about the ‘green’ paint he was holding. This evening we did some of basic color tests with Big E that I found on this site. Now, I’m not a doctor and I’m not going to flat out diagnose him, but I do think that perhaps he might have some problem seeing certain colors. He has to get a physical this summer to be ready for kindergarten so I will discuss it with his doctor at that point. Color blindness runs in my family, so it wouldn’t be surprising if he is. And it isn’t at all upsetting, I just need to be a bit more patient when I’m working with colors with him. If he isn’t seeing what I’m seeing, I’ll need to take that into account. 🙂 I’ll keep you posted as we learn more! We are coming to the end of the year for C’s American Heritage Girls group, and we are a little behind on a few things. We were sick for the last meeting, so we decided that today we would play catch up and work on her current badge, My Style. I also sat down with the kids this morning and told them that I thought we should spend part of our day doing something service oriented, so that C could work on some service hours for AHG. We threw out a few ideas, and together with the kids we landed on cleaning up the church parking lot. We got dressed in messy clothes and headed to the store for some gloves. The kids asked to take their Easter buckets to use as clean up tools and Big E found a small toy shovel to bring along. Naturally we picked up some snacks, and brought along some trash bags. We pulled into the empty parking lot and unloaded. The kids were excited about putting on their gloves and getting to work. Even Baby E grabbed his bucket and put on his gloves. Then we scoured the parking lot and surrounding area for any trash we could find. The kids got very excited for big ticket items like food bags or soda cans, but they did great getting the little stuff too. We took a short break in the middle of our working to have a snack, and then they got back up and went back to work. We got through two thirds of the parking lot before we ran out of steam. I let them play on the playground for a few minutes before we ran home, grabbed some lunch and laid down for a nap. When we woke up we headed to Walmart to pick up supplies for C’s My Style projects, got some Rita’s and headed back to the church to finish the job we had started. I thought it was important for the kids to follow through with what we had begun, because I want them to understand the importance of finishing a task. Thankfully there wasn’t too much left to do and we ended the evening with some more playing on the play ground. In total the kids worked two hours each on cleaning the parking lot and I was very pleased at how well they did. They even converted Baby E’s bucket to an interesting things bucket and filled it with oddities they found along the way, i.e.- a snake skin, a C-Clamp (Let me know if you are missing one), some mushrooms, and a golf ball. When we got home I made dinner and C worked on her poster for her AHG project. She had fun decorating it and will get to show it to her troupe tomorrow afternoon. We were all pretty exhausted and rather dirty by bedtime, but I think we will all sleep well. If you see the kids, don’t mention the parking lot. I don’t want them to think that service projects should come with recognition. I want them to do some of these activities so they can learn that life isn’t all about them, and that we should step up and help when we can, even if no one has asked. Big E had his end of the year ceremony for his preschool Mom’s Morning Out program this afternoon, so I ended up taking the day off so that I was sure not to miss it. Honestly, it was the first non sick day I have taken in about 8 months and it was definitely needed! I got all the kids where they needed to be this morning and then I ran a few errands. After that, I met up with C at her school and surprised her by joining her during her lunch period. I got to sit with her friends and talk and laugh. The very chatty little boy sitting across from me told me all about how he could see out his mom’s belly button before he was born, so he knew that she lived in Ocean City at the time. No one ever believes me when I tell them that, he said emphatically. Good luck, kid! After lunch with C, I headed over to Big E’s MMO ceremony. The kids were adorable, performing a song, and heading outside to eat popsicles. After leaving there we got the other kids and eventually made it to the beach, where we met up with some cousins and stayed for nearly three hours! The weather was hot, but as the evening set in, it really got very pleasant out. Baby E fussed for awhile, but finally came around. This evening was also the weekly farmer’s market, and we ran into a lot of people that we know, so the kid got to play with even more friends. Getting them to bed this evening was pretty quick work, as they were all pretty exhausted from their long day. And while I may not have gotten a lot of down time on my day off, I did get some great moments with my kids and the chance to hang out with some dear friends. As we sat at dinner this evening, I informed Baby E that he was not getting ice cream unless he ate all of his eggs. That little stinker picked up a whole handful of eggs, squished them in his hand, hid that hand on his lap and proceeded to tell me that he had eaten all of his eggs!!! He’s two! Where did he learn that move?? BTW- he didn’t get any ice cream. I woke up this morning with a serious case of the dizzies. Every time I stood up the world definitely tilted to the right and it didn’t take long to start feeling queasy. Tim stayed near work last night, which might have been a blessing because it forced me to push through how I was feeling and get C on the bus and the boys to the sitter. Strangely I felt​ fine driving, but the moment I parked the van at work, it started in again. So most of the day I was in a dizzy funk, but thankfully I was able to get work done in spite of it. When I picked the kids up this evening they begged for pizza, which I immediately agreed to because it meant I wouldn’t have to spend any dizzy time in the kitchen. 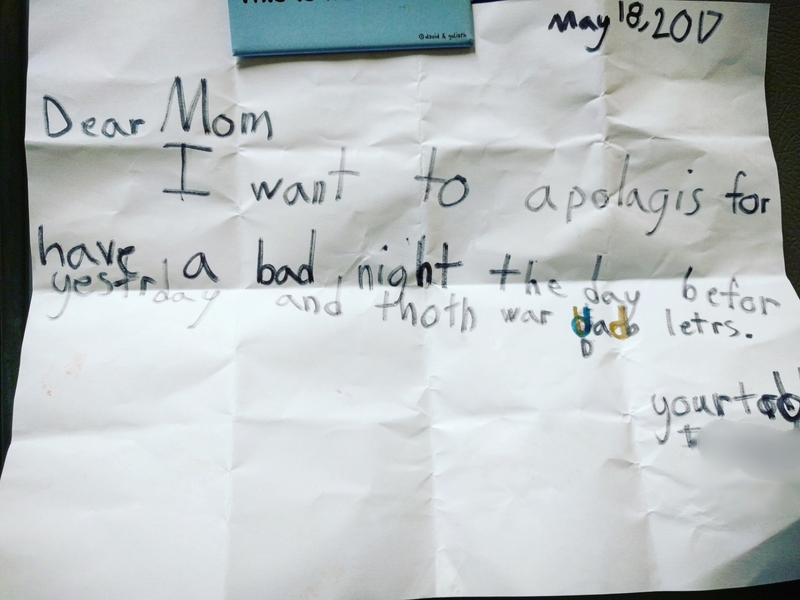 As we were eating our pizza, C ran out of the room and returned with a note she had written to me at school today, an apology for our rough evening the other night. This girl makes my heart smile. I read her letter and held her close, reminding her how much she is loved, no matter her behavior. She smiled and nuzzled her head in my neck. Such a sweet girl. My house is covered in sand. There is sand in the foyer, sand under the kitchen table, sand in the kids’ beds. There is sand everywhere. And that is completely fine by me, because tonight memories were made. Tim has been working a lot this past week, so for the most part it is just me and the kids. As I contemplated what to do with them on the ride home from work this evening I looked up to see that the car was reading 104 degrees outside. Granted it had been sitting in the sun so it wasn’t actually that hot, but the reality is 95 degrees is pretty hot too! So I ran by the house before picking them up to grab their bathing suits. They hurriedly changed and eagerly climbed into the van. When we got to the beach we ran into some friends, and the kids were off. They spent the next hour and a half running around, splashing in the water, making sand angels, swinging on the swings, playing pirates on the ship, and wearing themselves out. We didn’t get home until well after what should have been their bedtime. We ate a quick dinner and everyone was ready for sleep! There are not a lot of pictures of us from when we were kids, and even fewer with my mother in them, so I treasure the ones that I have- glimpses into a past I can’t remember, but is no doubt ingrained in her. I’m incredibly grateful for the selfless, wonderful woman who raised my sister and I, often single handedly as my dad worked long hours. And now that I am grown and have children of my own, it is such a blessing for me to see how she loves them. We got home this afternoon, and after a brief rest, we decided to get out of the house. We remembered that there was a small carnival going on down at the boardwalk, so we decided to head down there and check it out. When we got there, we bought some tickets and took turns taking the kids on their very first roller coaster (it was a tiny one, but they loved it all the same.) As I stared at the kids, I realized that this was a perfect opportunity to build some memories. We’ve had a rough winter, and our kids missed out on a lot of activities. We’ve been bogged down with sickness and crazy schedules, that it seemed like maybe tonight would be a great chance to just forget about all of that and just have fun. So Tim and I did something we NEVER do. We bought the older kids the bracelet passes that would get them on any ride all evening long. Tim bought one for himself as well because they were too small to go on some of the rides alone. We don’t normally spend that kind of money on an outing, but tonight it just seemed like the right thing to do for our family, an opportunity to relax and let go. And the kids enjoyed nearly every moment of it. Baby E was a bit challenging because he wanted to ride everything, but we compromised and let him ride the little train a few times, and then I let him walk around and splash in all the large puddles he could find. Sure, he was a mess, but it was a free activity and it kept him happy! As night was falling, we piled into the van and went to a local pizza place to end out our evening in grand style. Poor Big E fell asleep at the table, and Baby E scarfed down his pasta with a glazed over look in his eyes. Needless to say, they were all ready for bed when we got home!